Hey everyone. I’m trying to optimize every part of my chassis and suspension for track duty, and have already exhausted everything that’s on the market and more. I’ve recently been in touch with a Mercedes specialist that makes some unique chassis/suspension gear for other models, primarily to make some custom pieces for me, however they’ve expressed interest in working with me to develop parts for the C63 and getting into this space in a bigger way. This is a market currently not being supported by anyone, and if any vendors are reading this and interested as well I’d love to hear from them. What else am I missing? I know there are other things I’d like to work on around brake cooling, engine/trans/steering cooling and things like ceramic wheel bearings and rear diff mods and cooling, but I wanted this list to focus on chassis/suspension. 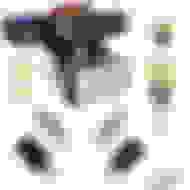 Mostly because that happens to be what I’m working on, but also bang-for-the-buck is likely to be high. Thoughts are welcome. I don’t even know if there’s a market out there outside of a dozen or so of us here? +1 on the front LCA. SDW will already do it. Next. Getting rid of the pano is about the only thing to do other than stripping the interior. Separate thread. KMAC makes poly rear control arm bushings, and Shardul @ UPD makes adjustable rear control arms with sphericals. Next! Hardened flex discs for those that didn't buy the carbon driveshaft. Front and rear sway bars (possibly adjustable). I don't think you can get the Eibach front for the C300/350 anymore. You has link to info? They have this thing called a phone number. Phones were a communication device people used to talk to each other and exchange information before millennials came along and ruined everything. Talk to David Green @ SDW and he’ll sort you out. Who TF uses a phone? I'm old and don't use that primitive form of communication. Didn't see any reference to it on their website. I think what's he's saying is that he used a phone and inquired about the upgrades, which the uppers FCP ended up stocking, and apparently they'll do the lowers too, which I imagine involves sending them over to Syncro to have them fitted. But to give Jim the benefit of the doubt because he's so efficient with his words, he says just call 'em for details..
Bingo. The best things in life are not “on the menu”. They’ll make it for you, you just have to ask. My bad, now that I re-read the one liner reply, it's completely obvious that I have to call them and ask for David Green. Was this the part you had trouble with? No, I wasn't confused when you were "helpful" after the cryptic sarcasm. Try to keep up brah. Hi W204 Performance/Race enthusiasts re suspension bushings and alignment! At K-MAC so involved in constant design, development - never seem to get around to promoting marketing, awareness of our product range. Thought this excellent opportunity to set out our suspension products we produce “in – house” – A “TOTAL SYSTEM” for the W204. Full speed main straight, then hitting corner race curbs, fully launching, then slamming down broadside lap after lap! 1. Yes we do manufacture the poly, uprated subframe bushings and the ‘2’ differential mounts. The diff. bushes not only poly but Mono ball, 2 axis/self aligning. 2. Many inquiries re uprated bushings for the ‘6’ rear “multi link arms” for tauter response, less rear end flex/loss of traction. Delrin bushings are available, but soon pound out with resultant noise, movement. K-MAC design resolves this situation, with excellent feedback re the significant improvement. 3. To complete the update of the rear suspension the other remaining rear bushings are the lower control arm ‘inner’ and the existing Toe arm bushes. 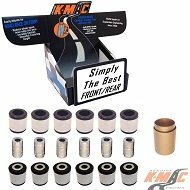 What we have designed here are replacements that not only eliminate the OEM rubber bushings, but we have managed to design so the LOAD BEARING AREA IS TWICE THAT OF ANY OTHER POLY BUSH DESIGN, further eliminating any rear end flex. ADDED BONUS – these lower, inner arm bushes are CAMBER adjustable and the Toe arm bush design doubling the existing Toe adjustment (which is necessary to compensate for the new rear Camber facility). This means with the unique K-MAC patented design “single wrench adjustment system” allowing easy access – TRACK DAYS using a “tire pyrometer” can precisely adjust for maximum traction. 4. NOTE: Also many requests re rear, upper Camber adjustment arms. Do not manufacture these. Reason being difficult to access, adjust and to resolve common, premature inner edge wear/improve traction they need to move top of tire “outwards” reducing essential clearance to outer fender. The only real benefit of upper arms is being able to adjust the top of tire “inwards to fit extra-wide profile tires. Trade off though is further increasing (not reducing) negative Camber, Costly premature inner edge wear! 5. FRONT SUSPENSION – we replace the entire ‘4’ lower arm OEM rubber and oil/air voided bushings. Again incorporating CAMBER and CASTER adjustment for the 1st time. Also precise, single wrench adjustment system. The very latest design breakthrough - have managed to increase the CAMBER adjustment to close on ‘5’ times that of the inaccurate one offset position fluted bolts. With the load bearing area “twice that” of any other poly bush, further reducing flex and extending bush life. Also no need to remove these arms from vehicle to install. 6. The forward facing “thrust arm bushes” have incorporated CASTER adjustment, allowing to compensate for the new Camber facility. To improve brake and steering response these bushings are often replaced with steel, spherical bearings. Problem is with their wafer thIn teflon liners they soon pound out. Through ongoing development the breakthrough here was to finally resolve this ongoing problem, latest K-MAC bushings having same attributes as spherical – “Mono ball/2 axis, self aligning” – but now with two and a half times the load bearing area with proportionally thicker liners to be noise free with extended life. 7. TO COMPLETE THE SYSTEM – remaining bushings are the front strut upper mounts K-MAC replacements (coil spring models) provide Camber and Caster adjustment (from engine bay) Additional adjustment to the lower arm adjusters for TRACK DAYS – up to 3 extra degrees in the pursuit of further reducing understeer to hit those corner apex’s every time and deeper into the corners with increased traction and braking response. Once again this unique patented design has revolutionized how adjustment is made – Fast, accurate from engine bay even if strut brace fitted. (Just the time taken to loosen the 3 mount nuts). 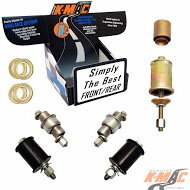 Unlike other brands not only available in a solid, unforgiving “full race” version (K-MAC STAGE 3). This design has similar center mounts to OEM, but instead of rubber is higher durometer poly. WHILE STAGE3 – the spherical bearings are massive – setting new standards 47mm (17/8 “) diameter. STAGE 2 AND 3 have incorporated “separate radial thrust bearings” for steering loads and prevent annoying spring drag, binding. Their fully sealed and again massive at 85mm (33/8 “) diameter. All other brands - adjusters are steel or soft billet alloy. K-MAC are the ultimate, very highest aircraft 7075 aluminum. No height increase and also fit with factory diameter or all brands of coilovers (60-70mm ID) and with “coil overs” - designed for minimum stack height. 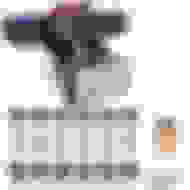 Last edited by K-Mac; 04-16-2019 at 12:54 AM. Having trouble finding the Rear Subframe Bushings, and Differential Mounts for the W204 C63 on the K-Mac website. Do you have a link with more info and specs on them? Hey Kevin. With all due respect because you’re a good dude and provide great service, many of us - myself included - have tried your product, then removed some of it to go in a different direction. No offense, just needed something different. That’s EXACTLY what this thread is about - things that are not on the market and improving on what’s already out there. Tell us more about the subframe and diff bushings please? I thought I had these on, but couldn’t remember receiving or installing, and they’re not on your website or in the pictures you posted above. It would be the 4 large rear subframe bushings I’m talking about (plus the 2 diff bushings). That’s what we’re missing. I’ll order a set TODAY if you have them. Thanks. 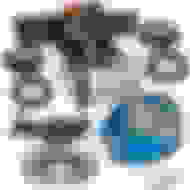 Last edited by BLKROKT; 04-16-2019 at 10:43 AM. I thought for sure I had the KMAC rear subframe and diff bushings in there, and installed with the Spoon Rigid Collars, but couldn’t find any record of receiving or installing them and didn’t see them on the website either. The subframe bushings would have been just massive (4), and I think I would have remembered receiving those. I got everything in one package and had Harry install everything so I forget. Will look under the car later. Last edited by BLKROKT; 04-16-2019 at 11:04 AM. 3. Rear link arms (6) – set of 12 bushings designed to eliminate rear end twitch/flex. - NOTE: these did not fit. 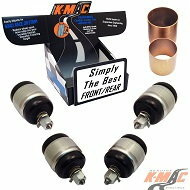 The KMAC bushings were flat-faced, while the OEM bushings were tapered on one side. Kept the OEM bushings in. Last edited by BLKROKT; 04-16-2019 at 11:05 AM.